On the east side of the main road through the cemetery, near to the Freemason's Memorial. 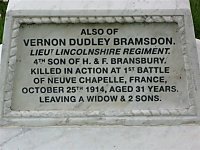 The memorial is in the form of a plaque which is part of the base to the headstone to the Bransbury family grave, 7 members of which are mentioned on it. 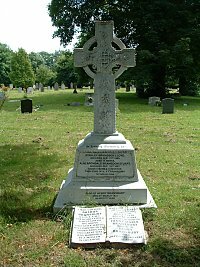 It is known that Vernon was born in Portsmouth, as presumably were his brothers Arthur, Stanley and Archdale, and that the family had been living at 59 Clarendon St., Portsea in 1881, when Vernon's father Henry was 27 and described as a 'Brewer and Maltster'. At the 1911 census Vernon was living in Redhill. His widow is recorded as returning to Portsmouth sometime after his death and residing at 111 Victoria Road South.